To my knowledge there are no good records that have been built by institutions run by committee. In almost all cases the great records are the product of individuals, perhaps working together, but always within a clearly defined framework. Their names are on the door and they are quite visible to the investing public. In reality outstanding records are made by dictators, hopefully benevolent, but nonetheless dictators. And another thing, most top managers really do exchange ideas without fear or ego. They always will. I don’t think I’ve ever walked into an excellent investor’s office who hasn’t openly said “Yeah sure, here’s what I’m doing.” or, “What did you do about that one? I blew it.” We all know we aren’t always going to get it right and it’s an invaluable thing to be able to talk to others who understand. Synchronicity begins where pure chance ends, with one event leading to another, like a chain reaction, but all brought about by the initial event which cannot be predicted or explained. In other words – don’t waste your time. Just have patience and make sure you’re confident about the margin of safety in each investment. Here’s a list that I would still be comfortable with decades from now. Every book below has stood the test of time and, I’m confident, will remain useful for generations to come. You will quickly note that some aren’t even about investing. But they all will help teach you how to think more clearly, which is the only way to become a wiser and better investor. When in his capacity as investor or speculator the business man elects to pay no attention whatever to corporate balance sheets, he is placing himself at a serious disadvantage in several different respects: In the first place, he is embracing a new set of ideas that are alien to his everyday business experience. In the second place, instead of the twofold test of value afforded by both earnings and assets, he is relying upon a single and therefore less dependable criterion. In the third place, these earnings statements on which he relies exclusively are subject to more rapid and radical changes than those which occur in balance sheets. Hence an exaggerated degree of instability is introduced into his concept of stock values. In the fourth place, the earnings statements are far more subject to misleading presentation and mistaken inferences than is the typical balance sheet when scrutinized by an investor of experience. As part of Stoic Week, Stoicism Today: Selected Writings can be downloaded for free from the Amazon Kindle store Monday to Friday [H/T Stoicism Today]. I’ve noted frequently in recent months that the lessons to be drawn from the recent market cycle are not that historically overvalued, overbought, overbullish extremes can be dismissed. Rather, the lessons to be drawn have to do with the criteria that distinguish when such extremes have little near-term impact from periods where they suddenly matter with a vengeance. Although we agree, as John Templeton once observed, that the four most dangerous words in investing are “this time it's different,” the fact is that one very specific effect of quantitative easing made the half-cycle since 2009 different from history, and forced us to struggle quite a bit. Market cycles throughout history have demonstrated an important regularity: once a syndrome of overvalued, overbought, overbullish conditions was established (not one condition alone, but the full syndrome), the behavior of the stock market took on what I’ve often called an “unpleasant skew” – the market would typically follow with a few weeks of persistent small advances, followed by an abrupt and steep vertical plunge that wiped out weeks or months of gains in a handful of sessions. In the face of quantitative easing, however, that pattern changed. As short-term interest rates have been held near zero, investors have been drawn into “carry trade” mentality, believing that they must take risk in stocks, regardless of valuation, because they have “no other choice.” Given that mentality – and make no mistake, this ispsychology at work, not financial calculation – overvalued, overbought, overbullish syndromes have persisted and extended in the half-cycle since 2009, often with no downside effects at all. Admittedly, I relied too heavily on the wicked historical record of these syndromes. But rather than discarding the lessons of history altogether, we did what we always do when faced with a challenge – which is to look for adaptations that are consistent both with historical fact and with new evidence. The upshot is this. Quantitative easing only “works” to the extent that default-free, low interest liquidity is viewed as an inferior holding. When investor psychology shifts toward increasing risk aversion – which we can reasonably measure through the uniformity or dispersion of market internals, the variation of credit spreads between risky and safe debt, and investor sponsorship as reflected in price-volume behavior – default-free, low-interest liquidity is no longer considered inferior. It’s actually desirable, so creating more of the stuff is not supportive to stock prices. We observed exactly that during the 2000-2002 and 2007-2009 plunges, which took the S&P 500 down by half in each episode, even as the Fed was easing persistently and aggressively. A shift toward increasing internal dispersion and widening credit spreads leaves risky, overvalued, overbought, overbullish markets extremely vulnerable to air-pockets, free-falls, and crashes. What’s rather beautiful about this distinction is that it applies equally well to bubble periods such as the late-1990’s, the housing bubble, and on imputed sentiment data, the advance to the 1929 peak, and these considerations help to identify the shifts that invited subsequent crashes. So unless one believes there’s something magical about quantitative easing that goes beyond any well-articulated or identifiable transmission mechanism, it’s quite a good idea to pay close attention to market internals and risk premiums here. I almost stopped selling Japan short in the last quarter of 1989 because I couldn’t stand it anymore. But intellectually I was convinced that I was right and so I carried on and then in the first quarter of 1990 the Japanese market fell by 25% in eight weeks and I made back everything I’d given away since 1987 plus a good deal more. But I tell you statistical overvaluation is a funny thing – it can go on for a very long time, far beyond the limits of rationality, and it is a problem for the value investor in two ways: it can tempt one to compromise standards on the buy side and it may lure one into selling things far too early. I have less of a problem with the selling temptation because I have always loved cash – if you’ve got lots of it you will never have to pass up a great opportunity. Note: Asia Bibi, a Christian Pakistani woman, was sentenced to death for blasphemy against Islam in 2010. The year before, while picking fruit with Muslim women, she took a sip of water from the local well. She was immediately accused of making the water impure by ​the other workers, ​who told her that they could no longer use the well. A​ccording to her husband, Ashiq Masih, and others, men and women started beating her and accusing her of making derogatory remarks against the Islamic prophet Muhammad, a charge she denies. Asia is currently in prison waiting to be hanged after losing an appeal ​on ​Oct. 16. She has told her story in a memoir, Blasphemy: A Memoir: Sentenced to Death over a Cup of Water, written with French journalist Anne-Isabelle Tollet. Busy can become a way of life. We’re seduced by all the incoming – the emails and text messages that make us feel wanted and important — stimulating our dopamine, as research shows, but in an exhausting, ultimately empty way. Busy has a dangerous allure. If your normal is busy, it’s tough to sit quietly with your thoughts or to really feel what you’re feeling. What if, instead, everything became a choice – how we spend time, who we respond to and how much or little we write? What if we recognized the difference between accomplishing our goals for the day and responding to other people’s requests? What if we learned to say no – a lot? For many of us, our ego soars when people make demands on our time. What if we could free ourselves from needing, or even wanting, this validation? What if, instead, we carved out the time and space to be productive however it best serves us? That may be consciously keeping ourselves not busy. We equate busy with productive but, as Ori Brafman writes in The Chaos Imperative, many great discoveries — from Einstein’s theory of relativity to Donkey Kong — were invented by people who built white space into their day. Imagine asking “How are you?” to one of the most successful people you know or, say, Elon Musk, Sheryl Sandberg or Warren Buffett. I’ve never heard anyone at that level respond, “busy.” By most people’s definition they are, constantly making high-level strategic decisions with a large impact. Two things. One, they aim to project an image that things are under control. Two, they actually have things under control. They’ve hired excellent staff, implemented thoughtful processes and spend time only on tasks that require their attention. Is that not something to strive for? As a reminder, Tony Robbins' book, MONEY Master the Game, is out today. For more, see THIS previous post and article link. James Altucher also just interviewed Robbins about his book, HERE. The current market environment joins the full range of ingredients that have characterized the most extreme market peaks – and preceded the deepest market plunges – in more than a century of history. On the basis of measures that are best correlated with actual subsequent market returns (and plenty of popular measures are not), we observe the richest market valuations in history with the exception of the 2000 peak. Even then, current levels on the best performing measures are only about 15-20% below the 2000 extreme. Current valuations now exceed those observed in 1901, 1929, 1937, 1972, 1987, and 2007. The 5-year market advance from the 2009 low, encouraged by yield-seeking speculation, now places the S&P 500 at more than double the level that we would associate with historically normal returns. Put another way, we presently estimate S&P 500 prospective nominal total returns of just 1.4% annually over the coming decade, with zero or negative average total returns out to roughly 2022. These valuations are coupled with extremely overbought conditions and the most lopsided bullish sentiment since 1987. Bearish sentiment is now down to 14.8% (Investor’s Intelligence), close to the low of 13.3% reached in September. Prior to this year, the last two times sentiment was nearly as lopsided were the April 2011 peak (just before a near-20% dive), and the October 2007 peak. GMO's 3Q 2014 Letter includes Ben Inker's "Is This Purgatory, Or Is It Hell?" and Jeremy Grantham's "Bubble Watch Update" and "The Beginning of the End of the Fossil Fuel Revolution (From Golden Goose to Cooked Goose)"
As always, the prudent investor (unlike the political year three) should definitely recognize overvaluation, factor in regression to the mean, and calculate the longer-term returns that result from this process. More easily, such prudent investors can use our seven-year numbers, which have a decent long-term record measured when we have viewed markets as overpriced, as we believe they are today, and a better record measured in the periods after bubbles break. The other necessary ingredients to the investment mix are suitable measures of risk, and when these are added to estimated returns we believe efficient portfolios can be produced. 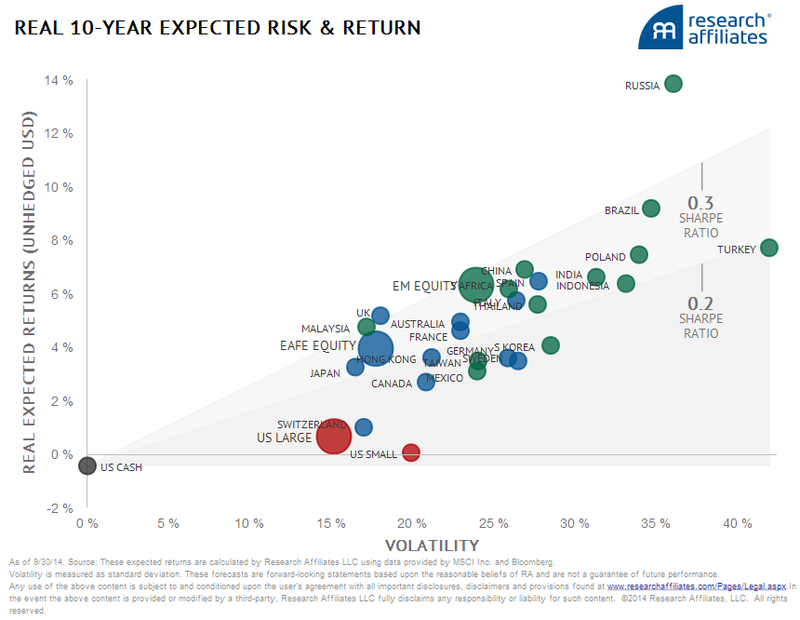 On our data, with U.S. large cap equities offering negative returns (-1.5%) except for high quality stocks (+2.2%), with foreign developed and emerging equities overpriced (+3.7%), and with bonds and cash also very unattractive, investors have to twist and turn to find even a semi-respectable portfolio. It is a particularly tough process today with nowhere to hide and no very good investments compared to, say, the time around the 2000 bubble when there were several. ...My personal fond hope and expectation is still for a market that runs deep into bubble territory (which starts, as mentioned earlier, at 2250 on the S&P 500 on our data) before crashing as it always does. Hopefully by then, but depending on what the rest of the world’s equities do, our holdings of global equities will be down to 20% or less. Usually the bubble excitement – which seems inevitably to be led by U.S. markets – starts about now, entering the sweet spot of the Presidential Cycle’s year three, but occasionally, as you have probably discovered the hard way already, history can be a snare and not a help. I have been periodically challenged to compress all this business of randomness into a few sentences, so even an MBA can understand it (surprisingly, MBAs, in spite of the insults, represent a significant portion of my readership, simply because they think that my ideas apply to other MBAs and not to them). This brings to mind Rabbi Hillel’s story, when he was asked by someone particularly lazy if Hillel could teach him the Torah while the student was standing on one leg. Rabbi Hillel’s genius is that he did not summarize; instead, he provided the core generator of the idea, the axiomatic framework, which I paraphrase as follows: Don’t do to others what you don’t want them to do to you; the rest is just commentary. It took me an entire lifetime to find out what my generator is. It is: We favor the visible, the embedded, the personal, the narrated, and the tangible; we scorn the abstract. Everything good (aesthetics, ethics) and wrong (Fooled by Randomness) with us seems to flow from it. Give yourself a gift: the present moment. People out for posthumous fame forget that the Generations To Come will be the same annoying people they know now. And just as mortal. What does it matter to you if they say x about you, or think y? Suppose, then, that you were not that Roman knight, but a freedman, you might nevertheless by your own efforts come to be the only free man amid a throng of gentlemen. "How?" you ask. Simply by distinguishing between good and bad things without patterning your opinion from the populace. You should look, not to the source from which these things come, but to the goal towards which they tend. If there is anything that can make life happy, it is good on its own merits; for it cannot degenerate into evil. Where, then, lies the mistake, since all men crave the happy life? It is that they regard the means for producing happiness as happiness itself, and, while seeking happiness, they are really fleeing from it. For although the sum and substance of the happy life is unalloyed freedom from care, and though the secret of such freedom is unshaken confidence, yet men gather together that which causes worry, and, while travelling life's treacherous road, not only have burdens to bear, but even draw burdens to themselves; hence they recede farther and farther from the achievement of that which they seek, and the more effort they expend, the more they hinder themselves and are set back. This is what happens when you hurry through a maze; the faster you go, the worse you are entangled. For all my emphasis on the virtues of patience in value investment it has to go hand in hand with minute attention to the detail, with conviction and determination, otherwise patience is just futile endurance. Regardless of the individual manager's particular investment discipline, superior investment returns come from one source -- the investment outcome must differ materially from that already discounted by the market at the moment when the stock is purchased. The gap between perception and reality is best thought of as a mispricing. The ultimate skill in this business is in knowing when to make the judgement call to let profits run. While it is true that 99% of investment effort is routine, unspectacular enquiry, checking and double checking, laboriously building up a web of information with single threads until it constitutes a complete tableau, just occasionally a flash of inspiration may be necessary. Once we have begun to build a position it has to be recognized that our intentions may change in the course of its construction. An influential, or even controlling, position quite often results from a situation where a cheap security does little or nothing price-wise for such a long time that we are able to buy a significant percentage of the equity. Whether our intentions remain passive under these circumstances depends on an assessment of the outlook for the company and the capability of its management, but I don’t think that we ought to be pro-active merely for the sake of it. My task is principally the identification of opportunity and the decision to press the buy button. This may sometimes turn out to be a catalyst in itself, but normally we should rely on others to do the promotional work or to put the company directly into play. Otherwise it will turn into a constant and time-consuming distraction from our prime objective of finding cheap securities to buy. ...it’s important to bear in mind that in addition to times when the errors are of commission (e.g., buying) and times when they are of omission (failing to buy), there are times when there’s no glaring error. When investor psychology is at equilibrium and fear and greed are balanced, asset prices are likely to be fair relative to value. In that case there may be no compelling action, and it’s important to know that, too. When there’s nothing particularly clever to do, the potential pitfall lies in insisting on being clever. It goes without saying that the fanatic is convinced that the cause he holds on to is monolithic and eternal - a rock of ages. Still, his sense of security is derived from his passionate attachment and not from the excellence of his cause. The fanatic is not really a stickler to principle. He embraces a cause not primarily because of its justness and holiness but because of his desperate need for something to hold on to. Often, indeed, it is his need for passionate attachment which turns every cause he embraces into a holy cause. The fanatic cannot be weaned away from his cause by an appeal to his reason or moral sense. He fears compromise and cannot be persuaded to qualify the certitude and righteousness of his holy cause. But he finds no difficulty in swinging suddenly and wildly from one holy cause to another. He cannot be convinced but only converted. His passionate attachment is more vital than the quality of the cause to which he is attached. This looks like an interesting paper, and it reminded me of THIS previous post/quote. In 1991, defense contractor General Dynamics engaged a new management team which adopted an explicit corporate objective of creating shareholder value. The company tied executive compensation to shareholder wealth creation, and subsequently implemented a strategy that included downsizing, restructuring, and exit. Paying large executive cash bonuses amid layoffs ignited controversy. However, by 1993 shareholders realized gains approaching $4.5 billion, representing a dividend-reinvested return of 553%. The study shows how incentives assist in shaping strategy, illustrates the political costs and economic benefits of downsizing, and demonstrates that even firms in declining industries have substantial opportunities for value creation. In our third quarter letter you will find our portfolio update and general market observations. Each quarter we highlight one component of our investment process. This quarter, in the section titled Grove of Titans, I will discuss the attributes of what we think constitutes an enduring business. Every statistician knows that a large, relevant sample size is their best friend. What are the three largest, most relevant sample sizes for identifying universal principals? Bucket number one is inorganic systems, which are 13.7 billion years in size. It's all the laws of math and physics, the entire physical universe. Bucket number two is organic systems, 3.5 billion years of biology on Earth. And bucket number three is human history, you can pick your own number, I picked 20,000 years of recorded human behavior. Those are the three largest sample sizes we can access and the most relevant. Peter then walked the class through how compounding and the law of reciprocity can be applied to these data sets and therefore applied to reason. A light immediately went on. Applying questions to these three large data sets simplified and strengthened how I was organizing and applying mental models. Kaufman’s approach provides a framework of general laws that have stood the test of time – invariant, unchanging lenses that we can use to focus and arrive at workable answers. A multidisciplinary framework helps shift the human paradigm to one of an empathetic perspective, as if we were looking from the outside in. Just as I began this letter with the three foundational insights of Dialectical Materialism, we want to be constantly searching for these types of invariant strategies that can serve us in rational decision-making. One of the most limiting biases for individuals attempting to make sense of complex systems is that they are a part of the systems. When you are part of the system it becomes increasingly difficult to see the forest for the trees. Each individual tree’s uniqueness and complexity can lead to confusion and ambiguity. The key is to attempt to step outside of the system and see the forest and trees for the essence of what they are. How can we find these groves or islands of simplicity in an infinitely complex world? Jason Zweig of the Wall Street Journal asked Charlie Munger to describe a key attribute of Berkshire Hathaway’s evolution over the years. His response: “There isn’t one novel thought in all of how Berkshire is run. It’s all about what [Mr. Munger’s friend] Peter [Kaufman] calls ‘exploiting unrecognized simplicities.” Peter Kaufman was sitting with Charlie during this interview after the recent Daily Journal annual meeting. The entire quote that Charlie was referencing was one that Peter attributes to a 28 year old writer for Sports Illustrated named Andy Benoit, who wrote these words to describe the essence of a particular quarterback’s genius: “Most geniuses—especially those who lead others—prosper not by deconstructing intricate complexities but by exploiting unrecognized simplicities.” This quote captures the essence of genius and can serve as a roadmap to the Grove of Titans. Our valuation concerns don’t rely on any requirement for earnings or profit margins to turn down in the near term. Valuations are a long-term proposition that link the price being paid today to a stream of cash flows that, for the S&P 500, have an effective duration of about 50 years. In evaluating whether “this time is different,” it should be understood that current valuations are “justified” only if 1) the wide historical cyclicality of profits over the economic cycle has been eliminated, 2) the average level of profit margins over the next five decades will be permanently elevated at nearly twice the historical norm, 3) the strong historical advantage of smoothed or margin-adjusted valuation measures over single-year price/earnings measures has vanished, and 4) zero interest rate policies will persist not just for 3 or 4 more years, but for decades while economic growth proceeds at historically normal rates nonetheless. Believe all of that if you wish. Without permanent changes in the way the world works, on valuation measures that are best correlated with actual subsequent market returns, stocks are wickedly overvalued here. The charts below show several of the measures that have the strongest relationship (correlation near 90%) with actual subsequent 10-year S&P 500 total returns, reflecting data from the Federal Reserve, Standard & Poors, Robert Shiller, and valuation models that we have published over the years. The first chart shows these measures as the percentage deviation from their historical norms prior to the late-1990’s equity bubble. While it’s easy to lose sight of the extremity of the present situation, these measures are well over 100% above their respective norms, on average. On the most reliable measures, we estimate that S&P 500 valuations are now only about 15-20% short of the 2000 extreme, and are clearly above every other extreme in history including 1901, 1929, 1937, 1972, 1987, and 2007. Again, these measures are also better correlated with actual subsequent market returns than popular alternatives such as price/forward operating earnings and the Fed Model (which adjusts the S&P 500 forward operating earnings yield by the level of 10-year Treasury yields). As of last week, based on a variety of methods, we estimate likely S&P 500 10-year nominal total returns averaging just 1.5% annually over the coming decade, with negative expected returns on every horizon shorter than about 8 years. I mentioned the new Tony Robbins book out “Money: Master the Game” in our prior post “The All Seasons Portfolio“. I think it is a good book, especially for the newbie wondering what to do with their money. It is really long, but market pros could probably skip to the last 25% of the book for the interviews, and honestly the Paul Tudor Jones one made the entire book worthwhile. I would buy it for that alone. How We Got To Now with Steven Johnson is a six part documentary series that reveals the story behind the remarkable ideas that made modern life possible; the unsung heroes that brought them into the world – and the unexpected and bizarre consequences each of these innovations has triggered. Areté a concept worth being familiar with. It is essentially what the Stoics mean by "virtue" and it is probably closer to what Ben Franklin was aiming for than the way many define virtue today. Arete, in its basic sense, means "excellence of any kind". The term may also mean "moral virtue". In its earliest appearance in Greek, this notion of excellence was ultimately bound up with the notion of the fulfillment of purpose or function: the act of living up to one's full potential. The term from Homeric times onwards is not gender specific. Homer applies the term of both the Greek and Trojan heroes as well as major female figures, such as Penelope, the wife of the Greek hero, Odysseus. In the Homeric poems, Areté is frequently associated with bravery, but more often, with effectiveness. The man or woman of Areté is a person of the highest effectiveness; they use all their faculties: strength, bravery and wit, to achieve real results. In the Homeric world, then, Areté involves all of the abilities and potentialities available to humans. In this light, Ben Franklin is supremely admirable. Born in Boston in 1706, he was apprenticed at the age of twelve to his older brother James, who owned a printing shop. After many disputes with (and beatings by) his brother, he yearned for freedom, but James would not release him from the legal contract of his apprenticeship. So at the age of seventeen, Ben broke the law and skipped town. He got on a boat to New York and, failing to find work there, kept on going to Philadelphia. There he found work as an apprentice printer and, through skill and diligence, eventually opened his own print shop and published his own newspaper. He went on to spectacular success in business (Poor Richard’s Almanack – a compendium of sayings and maxims – was a hit in its day); in science (he proved that lightning is electricity, then tamed it by inventing the lightning rod); in politics (he held too many offices to name); and in diplomacy (he persuaded France to join the American colonies’ war against Britain, though France had little to gain from the enterprise). He lived to the age of eighty four, and enjoyed the whole ride. He took pride in his scientific discoveries and civic creations; he basked in the love and esteem of France as well as of America; and even as an old man he relished the attentions of women and the art of flirtation. What was his secret? Virtue. Not the sort of uptight, pleasure-hating Puritanism that some people now associate with that word, but a broader kind of virtue that goes back to ancient Greece. The Greek word arete meant excellence or goodness, especially of a functional sort. The arete of a knife is to cut well; the arete of an eye is to see well; the arete of a person is... Well, that’s one of the oldest questions of philosophy: what is the true nature, function, or goal of a person, relative to which we can say that he or she is living well or badly? Thus in saying that happiness (eudaimonia) is “activity of soul in conformity with virtue,” Aristotle wasn’t saying that happiness is giving to the poor and suppressing your sexuality. He was saying that a good life is one where you develop your strengths, realize your potential, and become what it is in your nature to become. ...Kitto had more to say about this areté of the ancient Greeks. "When we meet areté in Plato," he said, "we translate it ‘virtue’ and consequently miss all the flavor of it. ‘Virtue,’ at least in modern English, is almost entirely a moral word; areté on the other hand, is used indifferently in all the categories, and simply means excellence." Thus the hero of the Odyssey is a great fighter, a wily schemer, a ready speaker, a man of stout heart and broad wisdom who knows that he must endure without too much complaining what the gods send; and he can both build and sail a boat, drive a furrow as straight as anyone, beat a young braggart at throwing the discus, challenge the Pheacian youth at boxing, wrestling or running; flay, skin, cut up and cook an ox, and be moved to tears by song. He is in fact an excellent all-rounder; he has surpassing areté. Areté implies a respect of the wholeness or oneness of life, and a consequent dislike of specialization. it implies a contempt for efficiency — or rather a much higher idea of efficiency, an efficiency which exists not in one department of life but in life itself. The damage done to the UK and US economies by buybacks in preference to capital investment was a central theme of my book The Road to Recovery, and it has found its way, not too often I hope, into these blogs. I have therefore been heartened by the growing interest shown by the financial press in this threat to our economies. The world is undergoing a radical shift towards lower economic growth at the moment. Some of the dynamics driving growth down are structural in nature (e.g. demographics), and even the most extreme monetary or fiscal policy will not change that. We are in for a period of lower, but still positive, global growth whether we like it or not. Despite the somewhat muted outlook, we continue to expect significant regional variations in growth and therefore also in interest rates and equity returns. Global GDP has averaged almost 4% per annum over the past few decades, but we are now closer to 3% and the number continues to shrink. It is almost unthinkable, at least the way we see the world, that this number will begin to increase any time soon and portfolios must be constructed accordingly. I am pleased to announce that your Board will henceforth focus on enhancing shareholders’ value. At the end of the financial year just ended, the net asset value per share of the Group was S$0.417 cents and the net tangible asset value per share was S$0.348 cents. At current conversion rate they are approximately A$0.369 cents and A$0.308 cents respectively. The Group has been continuously profitable since 2006 and has proven its resilience in having successfully navigated through unprecedented global financial crises. The last transacted share price on Friday 31 October at A$0.21 therefore does not reflect the true intrinsic value of the Group. In pursuit of this objective your Board has commenced to seek opportunities to unlock value in some of its investments concurrently undertaking relevant corporate initiatives primarily to re-align the Group’s new directions so as to maximise value for shareholders. The stock is still hovering close to the same price as when my colleague at Boyles, Matt Miller, gave his Value Conferences Idea Presentation. The problem with the loser worldview is that in many cases the only person who CAN fix the problem is you, even if you had nothing to do with causing it. A winner in that situation fixes his own problem. A loser sits indefinitely waiting for others to solve it for him, even knowing that won't happen. When indoor smoking was my problem, the fault was clearly with the smokers and with management that allowed it. So I went after them and made them fix their problem for my benefit. That plan worked because the problem was fixable. When I hit the diversity ceiling on two occasions, I chose to run instead of fight because in those cases victory seemed impossible. I also ran from my hometown because staying and convincing everyone to build some industry so I can get a good job seemed impractical.